Marine Le Pen has been egged during a public appearance on the French Presidential election campaign trail. 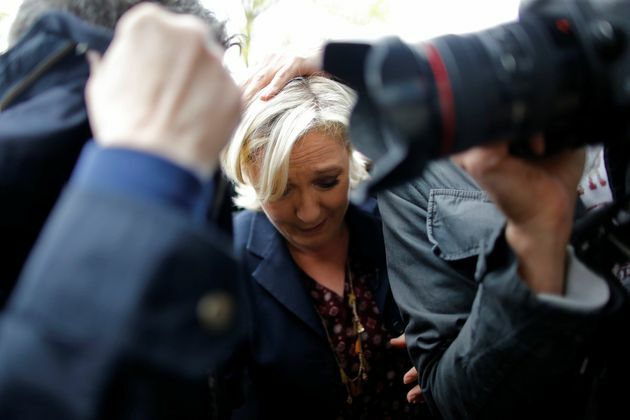 The French National Front (FN) party candidate had arrived at Dol-de-Bretagne, France, and was surrounded by bodyguards, TV cameras and angry demonstrators. As she was talking to a man in the crowd eggs began to pour down on her and her entourage and she was hurriedly escorted inside. The French Presidential election is heating up ahead of Sunday's vote and last night the only face-to-face televised debate between the candidates turned into a bitter clash with Emmanuel Macron branding Le Pen a "parasite" who would lead the country into civil war. The Front National leader, meanwhile, painted the former banker as a lackey of big business who is soft on Islamic extremism in a clash which one analyst described as "extraordinarily violent, bitter (and) harsh". The politicians clashed over their vision of France's future, the euro and ways of fighting terrorism, which has resulted in more than 230 deaths in France since 2015.